The Pact Iniftus is a natural magic of the land. Anyone can call upon it if the circumstances are right. - One party must have power over the other. - This can be any sort of power or influence, as appropriate to the situation, and need not even hold true for the general relationship. - The power may be temporary of fleeting. As long as one party has a distinct power or influence over the other at the moment, the pact can be made. - If neither party has power over the other, the Pact Iniftus cannot take hold. The pact does not care about equals, they can take care of themselves. - The stronger party may dictate the terms of the pact. - The party with power can determine the details of the pact. The weaker party must either agree or disagree entirely with the terms. - Too much negotiation leads the pact to view both parties as equals, and thus not take hold. Some negotiation is possible, but the generalities of the initial terms must be either accepted or rejected. - The terms of the pact must be understood by both parties. - The pact enforces not the word of the agreement, but the intent. Both parties must have a similar understanding of the intent, or else the pact cannot rectify the intent and thus fails. - The exact wording of the agreement is irrelevant. If both parties know the meaning of the "agreement" to be one thing, the pact acts according to that meaning, even if that is entirely different from what was said. - Similarly, both parties must be aware that the pact is invoked for it to have any power. - The weaker party can call upon the power of the Pact Iniftus unconditionally, but the stronger party must have the consent of the weaker party to do so. - Essentially, the stronger party can request the weaker party to agree to the pact, but the weaker party can invoke the pact regardless of the stronger one's preferences, even after the terms have been laid out, thus modifying an existing agreement. Intending to trick the stronger party into agreeing to something and then invoking the pact counts as having power of the other party, and thus prevents invoking the pact without the other party's consent. - The Pact Iniftus will protect an underdog, but it will not help a stronger part gain even more power over the weaker one with no recourse. - The Pact Iniftus has a strange sense of humor about people who promise outrageous things. Bragging about future exploits or making threats to those beneath you can require you to follow through with them. - Any two parties may have only one Pact Iniftus with each other at once. A newer pact replaces the previous one. - Tricking someone into making a new pact with you can let you weasel out of a previous pact. It is tricky, though. - While any two parties can only have one pact with each other at once, any given party can have any number of pacts at the same time, each with a different party. - The pact can be made from one to many, but not many to one. - A stronger individual can make a pact with many weaker ones at once, but many stronger parties must each make their own pacts independently with any given weaker party. - A small, closely knit group can be an exception, making pacts as a whole while in power. The pact respects those who think and act as one (literally or figuratively). - A pact cannot be made in proxy. Those who agree to it are those who are bound to it. - A pact can be conveyed through others, but those who agree to it are those who are bound, not those who communicate the agreement. 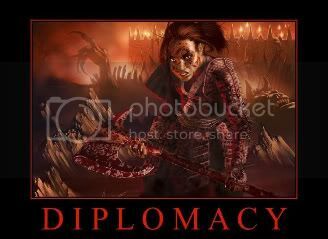 - The parties of the pact must know who they are dealing with. Specific details aren't needed, but the information each party uses to identify the other must be accurate. - Only those who actually agree to the pact are bound to it. - "Bring me to your leader" can be enforced, and has a good reason as negotiations should be done with the person in power who will lose the most for breaking the pact. Similarly, captured combatants may insist upon only surrendering to the leader of an army or nation. - Deals with the devil (metaphorical or otherwise) can be enforced to prevent one party from cheating the other. Since the pact functions through intent, neither party can effectively cheat the other. There are still just enough loopholes to have fun weaseling out of the deal in nontraditional ways. So, what can I do with this idea? It was one of those strange things, where it came to me in a dream, and I actually remembered it well enough when I woke up. - Any two parties may have only one Pact Iniftus at once. A newer pact replaces the previous one. Seems to be that you can break an old pact by forming a new anytime, am I mistaken? Only if your new pact is with the same person. Let me clarify it. It was hard for me to grasp why someone would want to use this. if you have greater power than someone, why would you make it so they can hold you to an agreement. I suppose it is so that the weaker cannot worm his way into the stronger one's plans and become a nuisance later. If you charm a person, you have power over them, right? And they fully understand everything, they just see it a helpful light for you. So, all of the terms of the Pact Infinitus are met, and you have an unfortunately unbreakable agreement formed. And, this whould work. You specifically stated that the power over someone counts, no matter how fleeting. As such, one's full agreement counts, no matter how fleeting, as long as they understand the terms. I mean, if someone were not charmed, agreed to the terms, then immediately regretted it and wanted to reneg, he would not be allowed. As such, a charmed person, for all intents and purposes, really wants to help the guy who charmed him. When the duration expires, he immediately regrets his actions and really want to reneg, but why should one work and not the other? You seemed happy to do it at the time. No redos, bub. Well, if it was a cosmic law that inflicted immunity penetrating negative levels for those who break an oath sworn in a certain way. That could work. It was hard for me to grasp why someone would want to use this. if you have greater power than someone, why would you make it so they can hold you to an agreement. Devils dealing with mortals would want such an arrangement in place to give the mortal an illusion of control, lulling him into a false sense of confidence and making him more likely to accept the contract. All they need is a good loophole, and let's face it, Hell probably has better lawyers.